Fifteen odd years ago, when we were young punks working in wine retail (and thought we knew everything about wine), Alex Head and I used to drink a lot of Pinot. I can still remember a night at BBQ King when we sat around drinking Burgundy (with pushed up corks) that Alex and Brad Williamson had purchased dirt cheap after the legendary Ultimo Wine Centre frozen container incident. 1er Cru Burgundy for less than $20 meant some very good drinking around that time. Since then things have changed for both of us, with Alex falling in love with Rhone reds and ultimately ending up making wine under his own name in the Barossa (and now with a young family), while I stayed in Sydney to write words about wine. I’ve had the pleasure of tasting most of Alex’s wines over the years, but it’s not often that I get to taste anything beyond current wines. That’s not a discrimination against Heady, but more a reflection that new releases dominate my tasting world. What a pleasure then taste these two releases from a friend’s cellar. 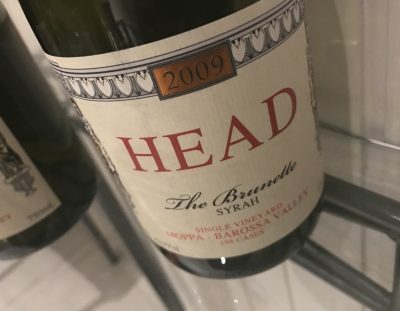 By my reckoning these 2009 wines were some of Heady’s early commercial releases (first vintage was 07 but I don’t think the wines were widely distributed until the 08/09s). Sourced from a single Vineyard in Moppa. Expansive coffee chocolate oak richness and there’s a meaty (whole bunch?) sausagey flavour here that takes a Rhonish detour. Lovely licoricey black fruit, bittersweet meaty edges and yet still berried and decadent, all capped off with excellent drying tannins. Long! Love the purple edges in here! You could be confused and pick this as Crozes in a nod. In prime health and just delicious. Best drinking: 2017-2029. 18.5/20, 94/100. 13.8%. Would I buy it? Wish I did. You wouldn’t pick the Viognier in this, but gee it’s lavish. Lots of sour purple fruit – there’s a real generosity and spread to this, all Dairy Milk chocolate, blackberry jam and rare roast beef – lots of meaty flavour flesh. It’s a step behind the Brunette in the complexity stakes, and the warmth on the finish shortens things up, but a lovely chunky and very rounded flow of rich flavour. Best drinking: 2017-2025. 17.7/20, 92/100. 14.5%. Would I buy it? I’d share a bottle. Thanks for posting this – this is exactly the sort of thing that I love to read. I first started buying Alex’s wines with the 2010 vintage and at the time was so impressed that I gathered my pennies together to find a 2009 brunette, which is still doing time in my cellar.